When MN Reads’ reviewer Kelly met Pete Hautman she said she went temporarily mute because she wasn’t sure what to say to someone whose books she admired so much. I can understand. Hautman’s National Book Award-wining Godless is amazing. His latest is How to Steal a Car and he’ll be reading from it at 6:30 tonight at the Golden Valley Library, 830 Winnetka Ave. N. Golden Valley, MN 55427. Also, Pete’s running a video contest on his website. 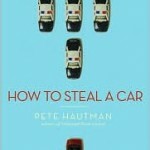 Create a short video based on his How to Steal a Car and you could win an entire, autographed set of his books. You can get all the details on his blog. I am devoting this week to Terry Pratchett. Yes. Too many to name. Recently, I fell hard for Julia Child. Wait–was she real? I would take Jack Vance to the New French Bar in Minneapolis circa 1984 and leave him there for others to enjoy. Brave Cowboy Bill, a Little Golden Book by Kathryn Jackson. I still have it, sans covers. I don't understand. How would becoming a book help me to save it? Would the book have legs, or better yet, super powers? Could I be the Asbestos Edition? Also, what year are we in? Didn't the story in Fahrenheit 451 take place in the 1980s? Does that mean my own books aren't eligible? This is so hard! That would be the completed version of this vexing, untitled, unfinished novel I have been working on for the past twenty years. . .